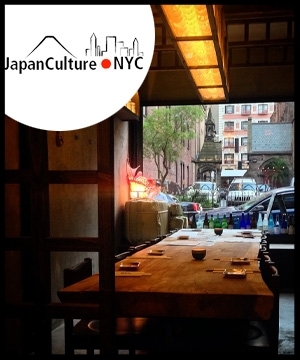 Also in Midtown is Izakaya NoMad, located at 13 W. 26th St. (between Broadway and 5th Ave.), is another top choice, with Yelpers giving it four stars out of 534 reviews. Look for offerings like enoki mushrooms wrapped in smoked bacon, okonomiyaki (a Japanese-style pancake with meat, seafood and vegetables) and vegetable tempura. The Madison Square Park area has never been known for izakaya, the Japanese gastropubs that are haunts of salarymen, sake drinkers, and adventurous eaters alike. Izakaya NoMad is out to change all that as I learned during a press dinner recently. With a whimsical dining room featuring a Godzilla mural, it offers an accessible alternative that sits somewhere between the rarefied air of a Sakagura and St. Marks’ grease bespattered yakitori joints.